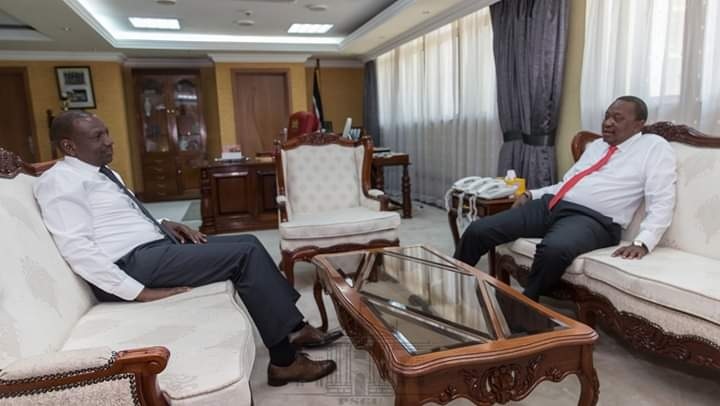 Tuesday March 26, 2019 - Deputy President William Ruto and Treasury Cabinet Secretary, Henry Rotich, may be holding President Uhuru Kenyatta by the balls which explains why he is not achieving results as far as the war against corruption is concerned. This was revealed by Economist David Ndii, who claimed that President Uhuru Kenyatta was cornered by Ruto and Rotich in Sagana. In a post on his official social media handle, Ndii claimed that the two read the President the riot's act face to face - no wonder he has chickened out. “Ruto, Rotich cornered him in Sagana the other day," Dr. Ndii wrote. Ndii wondered why Uhuru had to go all the way Namibia to throw a jab at Ruto back home when he can do it face-to-face. "...read him riot act mundu khu mundu but he has to go to all the way to Windhoek to shake fists at Ruto, then chicken out?" he asked. “You can be my brother or my sister or my closest political ally but if you are corrupt we will fight you,” President Kenyatta stated while in Namibia before his social media accounts were pulled down.